The more I use teff flour, the more I like it. Thanks to its incredible properties I am happy to share a gluten-free, gum-free and starch-free bread recipe! Unlike most gluten-free breads, this one doesn’t feel gooey so you won’t need to toast it to appreciate it. Hold your horses, dear neighbors, don’t get overly excited, I am not promising a loaf that will taste like a French baguette! This bread is brown, dense and somewhat reminds me of some of the whole grain bread that I used to buy. Contrary to, say, rice flour, teff flour can be kneaded into a dough, and really surprises me every time I let it sit : it rises very fast, in less than two hours, fills up the pan nicely and even «splits open» as regular wheat dough would ! It rose even more so the day I started to include a little applesauce (for the pectin) into my mix. I hope you get to try it ; all the ingredients in here are natural and should not pose a problem if you are sulfite-intolerant. But I should warn you that you may, like my Significant Other, be tempted to eat more than a reasonable share ! 1. Activate the yeast with some of the lukewarm water in a small bowl. Keep in mind that hot water will kill the yeast, resulting in a dough that will not rise. You may add a pinch of sugar / agave nectar / honey to help the process : bacteria love sugar ! 2. Meanwhile, weigh and mix all dry ingredients in a large bowl. I prefer a bowl with a wide bottom when kneading by hand. I have also tried doing it with my « fancy » mixer (a most-appreciated retirement gift! ), using the dough hook ; the result was ok but not as nice as when I worked the air into the dough by hand. It’s all up to you. Personally, I find great joy kneading with my hands. 3. Add in the activated yeast, applesauce and most of the water and knead for about five minutes. When the dough gets sticky, pour some of the leftover liquid (oil and water) under and over the sticky dough and work it in, kneading until dough gets sticky again . Repeat until all has been used ; this will add another five minutes of kneading. The dough should now feel soft and supple. 4. Mold into a loaf and place inside a lined greased baking pan, European or American size : I have tried both and the given quantities are fine for either one. Cover with oiled plastic film and place in a warm spot. You can also put your loaf inside a sealed plastic bag. When we are heating our house, I place my loaf on top of or next to a radiator. Otherwise I leave it behind a sunny window. Let rise for an hour or more, until dough has nicely expanded and looks puffed, or, as the expression goes « has doubled in size ». Rising time depends on surrounding temperature. Before and after rising photos of loaf in American size pan. 5. Cut 2 slits in top of dough and bake loaf for 15 minutes; lower temperature to 185°C / 365°F and bake for an additional 1h15mn. Remove and place on a cooling rack before slicing the bread. The slices can be frozen. This is the season when I start thinking about stocking up for summer as I hate baking bread in hot weather! * a word on butter : a dairy product and normally to be avoided by my Significant Other, we have realized that he can have it in ghee form : I buy lactose-free butter, then cook it over very low heat, removing the foam (milk protein) as it forms at the top. Looks like an old-fashioned Russian or German bread – I have to look into it. “…and there’s nothing in it!” says my ever so funny husband! I like the oats in there. They definitely add something. Thank you, have a nice day, Dolly! I am not so much into eating bread any more, but I must say this one is special. My husband loves it. 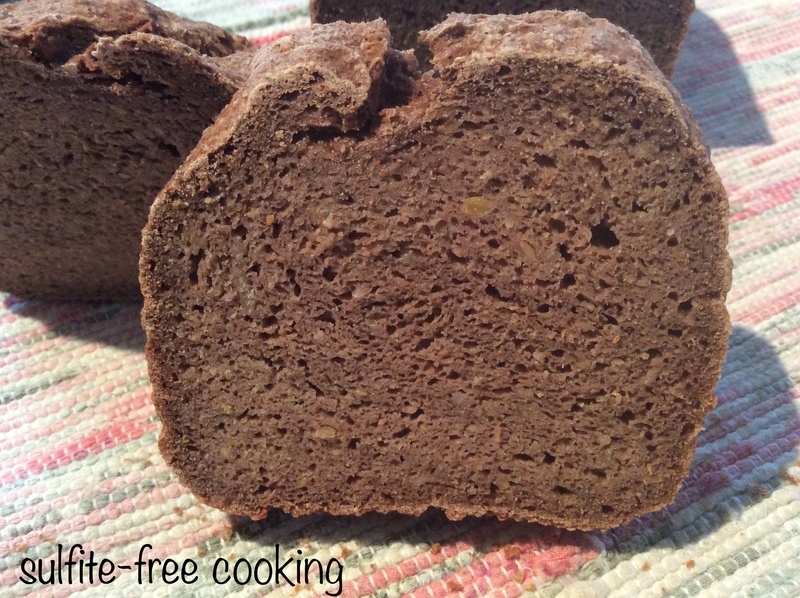 If you like whole grain bread, this one is for you! Looks like a delicious loaf. Your dear neighbour has quite a bit of experience with funky tops and strange rises in free-from loaves. I’ve had it from a good source that it can be an issue with the fats in a loaf, too little possibly. I know if I add a little extra fat that my loaves don’t crack as much. I also think it can be from trapped air and I’ve found rapping the tin on the counter-top before baking can help alleviate this problem slightly. Though this is for bater breads, I have no experience with yeast breads. I know you’ll figure it out and I’m sure that it tasted just great as is. I’m still keeping an eye out for teff flour, for now buckwheat and I will stick together. I will probably give it a try with baking soda some day. So many things to try, for us adventurous neighbors, and so little time! I was going to make waffles… Then realized I had chucked out the cord of my old forgotten waffle iron when I cleaned up the basement last autumn! This neighbor is not proud of herself.